Dear Customers, it has come to our attention that an unknown entity has been impersonating Harvey Norman Singapore through phishing emails and web pages. 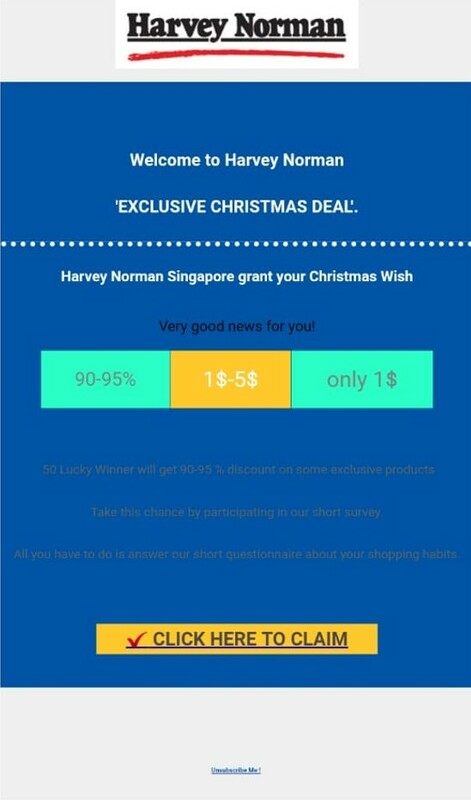 These phishing emails requests for users to click on a link to complete a questionnaire, in order to redeem a free gift from Harvey Norman. This promotion is not endorsed by Harvey Norman Singapore. 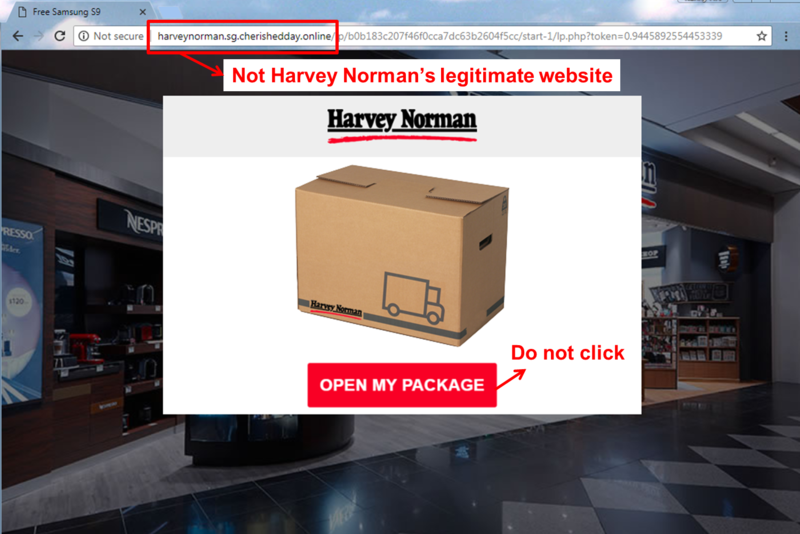 The button is not a legitimate link to Harvey Norman's website. 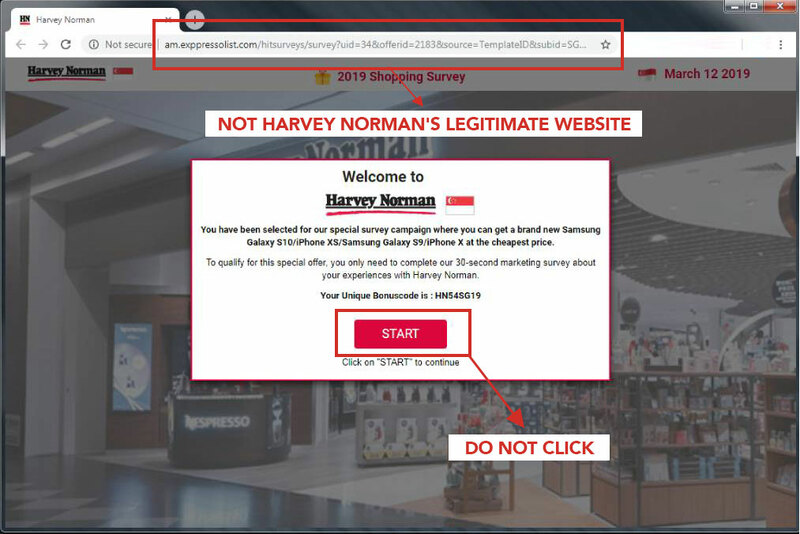 If a customer falls victim to the phishing email and clicks on the link, they will be redirected to a page (shown below) requesting for users to complete a questionnaire to redeem an optional reward from Harvey Norman. 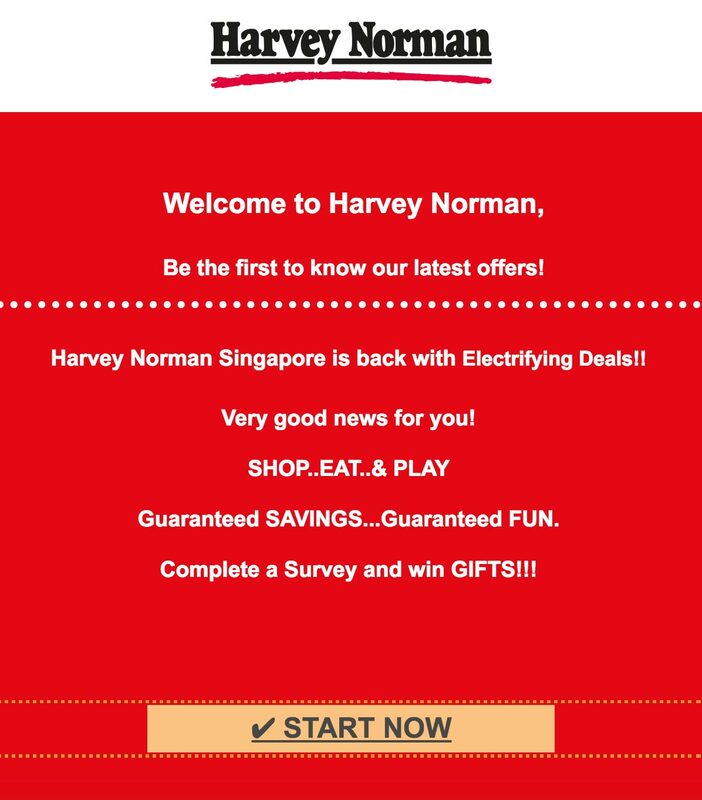 Always check that you are on official Harvey Norman Singapore website (https://harveynorman.com.sg). Dear Customers, it has come to our attention that an unknown entity has been impersonating Harvey Norman Singapore through phishing SMSes and web pages. These phishing SMSes requests customers click on a link to claim a prize draw. This promotion is not endorsed by Harvey Norman Singapore. Subject: EXCLUSIVE DEALS!!! Win Exciting Prizes!!! HURRY!! Dear Customers, it has come to our attention that an unknown entity has been impersonating Harvey Norman Singapore through phishing SMSes and web pages. These phishing SMSes requests customers click on a link for a free mobile phone. This promotion is not endorsed by Harvey Norman Singapore. Happy Friday! You have (1) Package from Harvey Norman! If a customer falls victim to the phishing SMS and clicks on the link, they will be redirected to a page (shown below) requesting for a user to click on a link to redeem a free mobile phone.